- Former WWE star Rosa Mendes underwent surgery to repair a torn ACL and meniscus in Pittsburgh this week. Rosa recently returned to the indies and has been planning to work more shows in the near future. 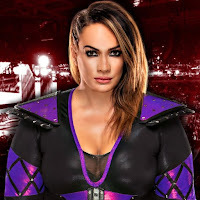 - Nia Jax has been training at the WWE Performance Center in Orlando this week, according to PWInsider. We now know that Jax has been out of action with a leg injury as of late. She has been doing physical therapy on her leg at the Performance Center. - Below is video of NXT Women's Champion Kairi Sane with former NXT Women's Champions Sasha Banks and Bayley in Osaka, Japan this past weekend. The Osaka live event saw Sane, Banks and Bayley defeat The Riott Squad.